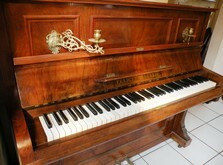 From our experience and understanding of string musical instruments and antique furniture, as a natural progression came our interest in restoring piano cabinets. It is sad to see how many pianos are left unattended because they are sensitive and difficult to transport. We believe all music instruments should be loved and well cared for, so we started this part of our business.